Bud Light presents Real Men of Genius. Like any other so-called smart device, you think you're better than regular fridges. You make ice, so what? What makes you smart, buddy? A companion app. Like we haven't seen one of those before. Your companion does the thinking. You sync up to my team's schedule and send out notifications whenever beer is running low. How many cans are left? Just look at the screen on the front door. 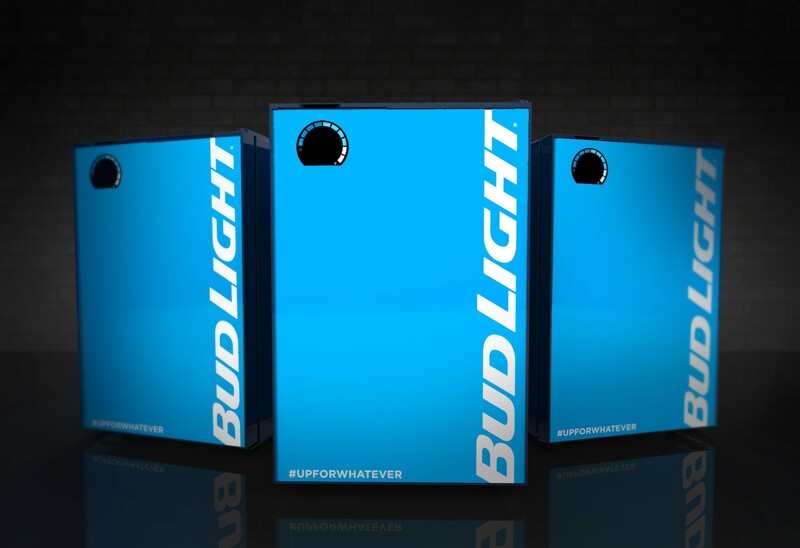 So crack open an ice cold Bud Light, Mr. Bud-E smart fridge. And get the delivery guy to bring some more, because that was the last one. *Available only in California, with beer delivery exclusive to Los Angeles, San Diego, and San Francisco. Currently priced at $299, down from $599. NEW YORK, Oct. 5, 2015 /PRNewswire/ -- Bud Light, the official beer sponsor of the National Football League, is introducing the ultimate in smart technology innovation at the start of the season to ensure that sports fans never run out of Bud Light when watching the action. The Bud-E Fridge is a first-of-its-kind smart home beer fridge that enables consumers the ability to view real-time information from their fridge – from the number of Bud Light cans and bottles in it to when the optimal temperature is reached for them – from anywhere that they have access to a mobile device. Developed by Bud Light, Buzz Connect, and Linq IQ, the Bud-E Fridge and its accompanying smart-phone app (available on both Apple and Android devices) lets sports fans program their favorite sports teams so that the Bud-E Fridge can keep them up-to-date on when games are approaching. When games are approaching, the Bud-E Fridge immediately lets them know if their game day supply of Bud Light needs replenishing, and as fans re-stock their fridge, which has a 78 beer capacity, the Bud-E Fridge updates the stock level in real time. A countdown timer indicates when the Bud Light will reach the optimal serving temperature, which the Bud-E Fridge achieves by chilling beers below 32 degrees without freezing them. "We are constantly looking for innovative ways to enhance the consumer's experience and the Bud-E Fridge represents an unprecedented advance," said Lucas Herscovici, Vice President of Connections at Anheuser-Busch. "With the Bud-E Fridge, we've created something that shows how we continue to push the boundaries in technology and innovation, particularly in the connected home of the future, and provide beer drinkers with new level of convenience to better enjoy Bud Light with their friends." The Bud-E Fridge also provides consumers with alerts of when it is running low on Bud Light, regardless of whether an upcoming game is taking place, via the smart phone app. In addition to these alerts, when the Bud-E Fridge is low on Bud Light, the mobile app integrates with beer-delivery service, Saucey, allowing consumers to order Bud Light for home delivery in San Francisco, LA, and San Diego. Bud Light has a history of success with new technology innovations in the beer industry. This past January, Bud Light rolled out the Bud Light Button in the District of Columbia, a beer delivery app that allows users to order Bud Light with one easy tap of the finger. The Bud-E Fridge is available for purchase by California residents only at this time at BudLight.com/efridge.